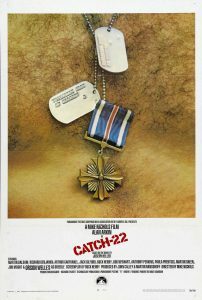 As a complement to our “Bomber Boys: Portraits from the Front” exhibit, Harbor History Museum has partnered with the Gig Harbor Film Festival to present a screening of the 1970 film, CATCH-22. A bombardier in World War II tries desperately to escape the insanity of the war. However, sometimes insanity is the only sane way to cope with a crazy situation. CATCH-22 is a parody of a “military mentality,” and of a bureaucratic society in general. CATCH-22 is a 1970 American dark comedy adapted from the novel of the same name by Joseph Heller. In creating a dark comedy revolving around the “lunatic characters” of Heller’s satirical anti-war novel set at a fictional World War II Mediterranean base, director Mike Nichols and screenwriter Buck Henry (also in the cast) worked on the film script for two years, converting Heller’s complex novel to the medium of film. The film will be shown at Galaxy Theatre, located at 4649 Point Fosdick Dr NW, Gig Harbor, WA 98335. As a precursor to the film screening, Museum Director Stephanie Lile will offer a look inside the real world of famed novel and movie CATCH-22, the very bomb group our exhibit “Bomber Boys: Portraits from the Front” is based upon. These men flew B-25 bombers throughout the Mediterranean theater, risking life and limb in strategic bombing efforts that helped bring the war to an end. The presentation will include the backstory of the “Bomber Boys” exhibit and serves as a great intro to the special showing of the 1970 CATCH-22 movie being shown at the Galaxy Theatre on April 24th in partnership with the Gig Harbor Film Festival. 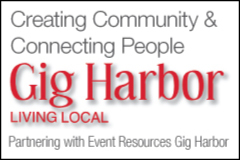 Lile’s presentation of “The Real Men of CATCH-22” as well as the screening of CATCH-22 at Galaxy Theatre are FREE to both Harbor History Museum members and Gig Harbor Film Festival members. RSVPs are requested as seating is limited. RSVPs can be made online or directed to Zachary Sokolik, Marketing & Development, at marketing@harborhistorymuseum.org. Admission to “The Real Men of CATCH-22” is $5.00 for non-members and may be purchased online or at the front desk of the Museum. Admission to CATCH-22 at Galaxy Theatre is $10.00 for non-members and can be paid at the door.